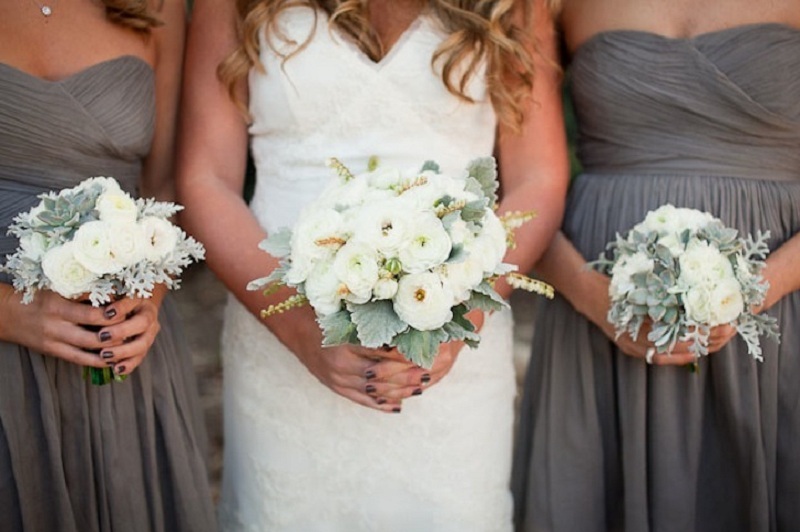 Wedding bouquet – the most important accessory in the bride’s attire. If you make this wedding attribute with your own hands, then it will cease to be just an accessory and will turn into a kind of charm for your future family. After all, creating things with your own hands, you put your soul into them and charge you with the energy of happiness. In Europe and the USA, it is particularly relevant and fashionable to make bouquets of artificial flowers, since it is fashionable, original and inexpensive. 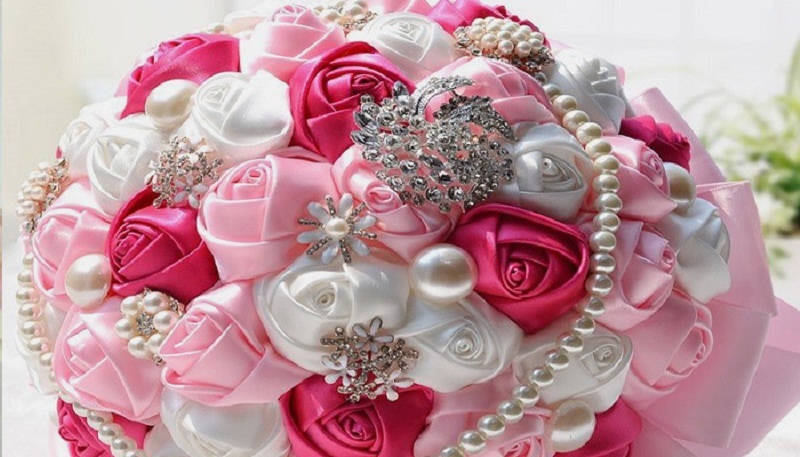 Most brides do not think about creating an artificial bouquet. Following the outdated stereotype, most people believe that inanimate flowers are easily distinguished from the real ones because they look poor, unnatural and cheap. Artificial analogs are in many ways superior to their “living” counterparts. Experienced florists are able to turn materials such as plastic, wire, paper, fabric, etc. into real floral masterpieces that will not yield to their “living” counterparts unless they have a fragrant natural floral scent. Modern artificial flowers are mainly produced in Europe with the strictest quality control using the latest technologies, in exact correspondence to the forms and colors of natural colors. The dyes used in their production, environmentally friendly and do not cause allergic reactions, and do not fade for many years. Your guests will not be able to guess at the closest sight that wonderful flowers in your wedding bouquet are created by man. Choosing flowers with sparkles, pebbles or stamens, beads, be sure – they will hold tight throughout the celebration. Persistence a serious problem with the use of live bouquets is their susceptibility to environmental conditions, such as heat, wind, frost. 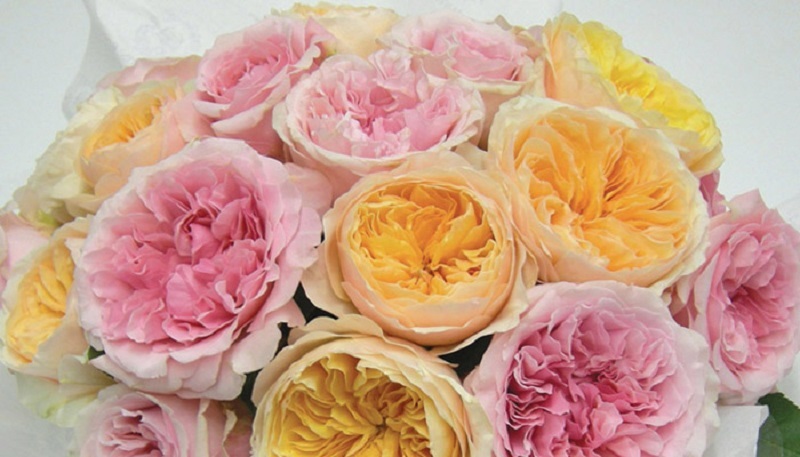 Fresh flowers are extremely sensitive to mechanical stress and lack of water. This problem has brought a lot of grief to the lovely brides, causing a lot of trouble in resuscitating him. With inadequate packaging, he may not even “live” before the start of the celebration or look inappropriate for this event. The main advantage of wedding flowers made from artificial flowers is that they will not lose their beauty during a long solemn day, no matter what time of year your wedding takes place. This wedding attribute will retain its charm and beauty even for many years, as long as it is kept in your memory of the happiest day of your life. Such accessory brides use when you have to postpone a photo session for another day. 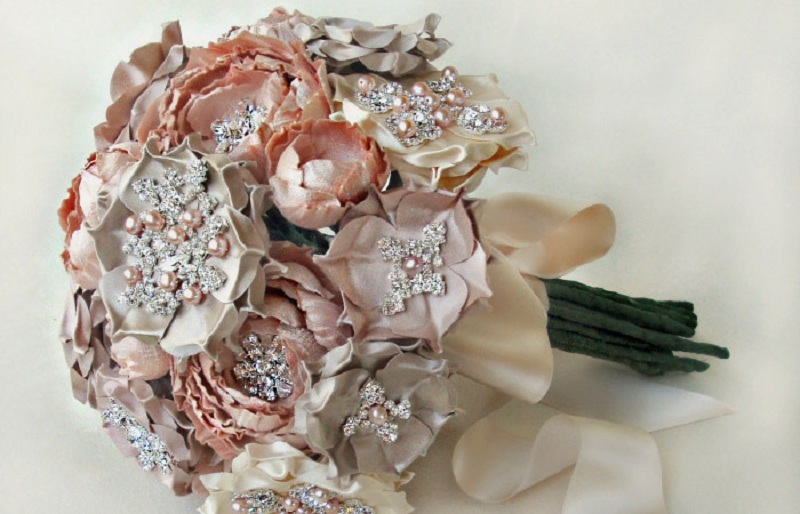 The proposed version of the bridal bouquet is ideal if the wedding dress or dress is difficult to find accessories that match the shade and texture. Fresh flowers often cannot meet such requirements or it is extremely difficult to pick them up. A variety of colors of artificial colors is amazing. You can easily pick the flowers in the composition with the accuracy of the smallest shade corresponding to the color and shade of your dress and celebration. Such compositions allow you to make bold additions in the form of various jewelry, stones, pearls, jewelry. An important point will also be the comfort of using such an accessory during a wedding celebration. Artificial flowers are much easier alive, they are more convenient to transport. Such a wedding arrangement will not “flow” and will not stain your outfit, will not fade and will not faint. For your peace of mind, the wedding attribute is best done in advance, to be absolutely sure that it will be exactly as you intended, regardless of weather conditions or flowering plants you need. 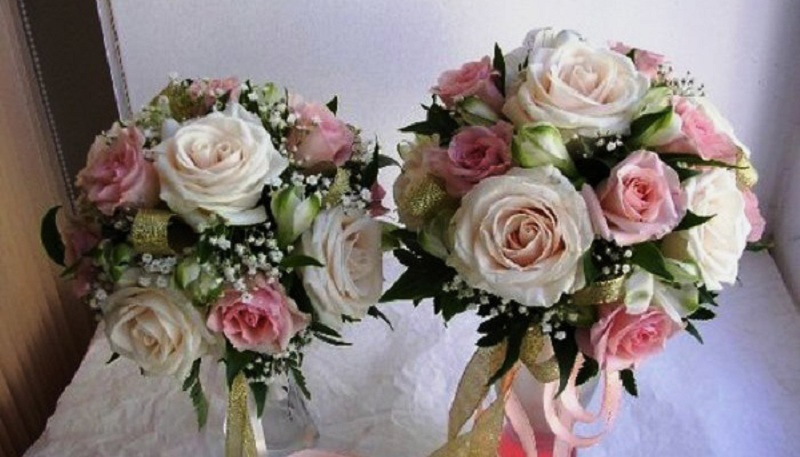 The cost of the wedding bouquet also has considerable value. High-quality fresh flowers, especially if they are rare and cut only 1-2 days ago, will be expensive. The price range of modern artificial flowers of the highest quality will be much lower. 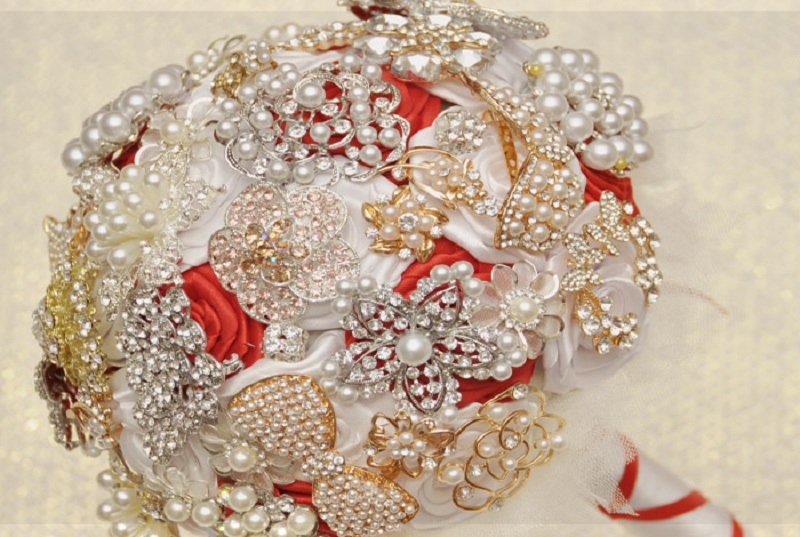 In addition to the benefits already described, the price of the finest wedding bouquet and accessories will be lower than that of their “living” counterparts. 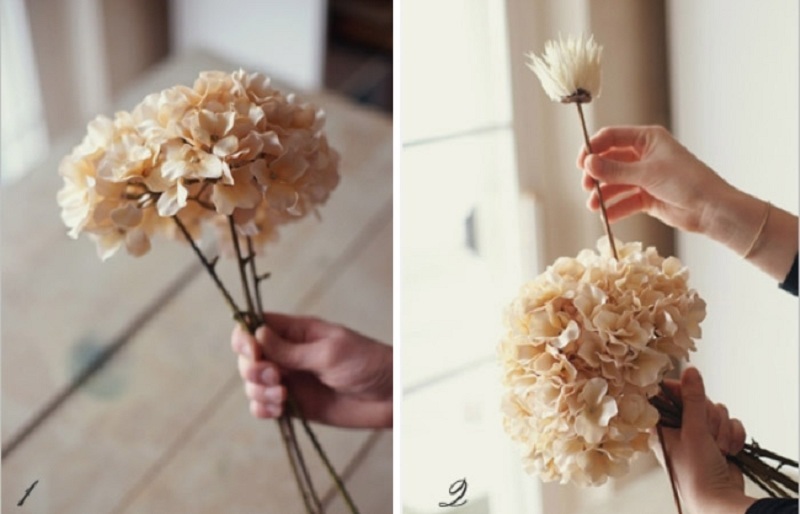 And if you make a bouquet with your own hands – this will help you further reduce the budget of your wedding. Why do I need a doublers bouquet? If your wedding bouquet has a complex shape, for example, drop-shaped or in the form of a handbag, or even a bouquet-fan, then throwing it over the head can be difficult. And if it is also heavy, it will cause concern for the safety of the health of your guests. Many girls are of the opinion that a wedding bouquet should be kept as a souvenir and given to someone else’s hands – this is a bad sign. You hold the wedding bouquet in your hands all day and give it your energy. To solve these problems and superstitions, doubles were designed. Substitute bouquets are artificial because such a wedding bouquet will remain for a long memory of the girl who catches him, over the years he will lose neither his appearance nor his form. These bouquets are much easier to create, giving them any shape and adding to them a variety of decorations. 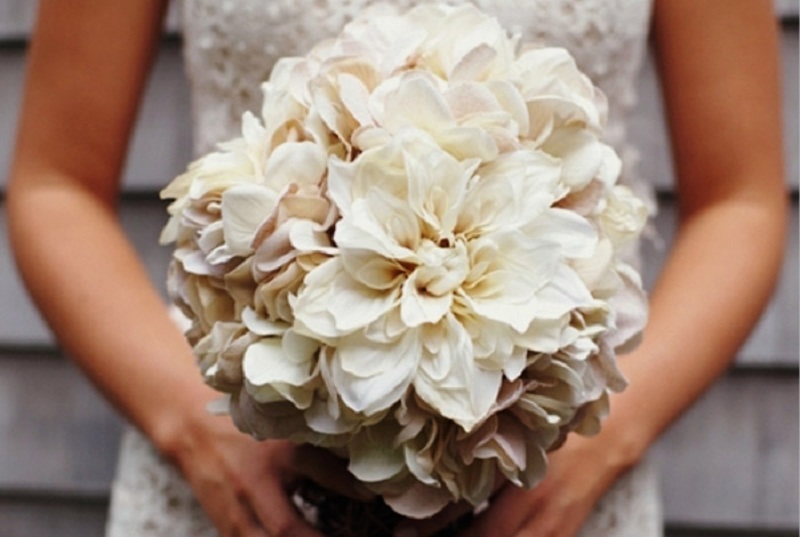 A variety of colors and shades will create a stand-up bouquet that fits perfectly with the color scheme of your wedding. Creating a variety of beautiful artificial flowers, use your imagination, give free rein to emotions. Feel free to use different materials: thin paper, cloth, silk, ribbons, cold porcelain. You can use almost any jewelry: beads, pearls, stones, lace, feathers, jewelry. If you prefer it to be simple, but with taste, then a master class on creating a simple, but elegant and stylish bouquet will help you. A sharp knife or pruner. Cut with a pruner or a sharp knife all the leaves and branches with artificial flowers. Try to make the trunks of flowers even. Then take 3 hydrangeas and fold them into a tight bunch so that you get a triangle. Add three more hydrangeas to them, placing them so that they are slightly lower on the “sides” of the triangle. It is important that in the center there is a little free space – it will be the last flower of hydrangea. The last flower should be placed slightly higher than the others, in order for your wedding bouquet to have a more round and neat shape. Next, take three artificial chrysanthemums and add them to the bouquet, but not from the edge, but closer to the center. Try that chrysanthemums are not closely located to each other, they should be placed so that they form an open triangle. In order for your wedding bouquet not to lose its shape, flower stems should be tightly wrapped with floral wire, on top (almost under the flowers), in the center and on the bottom. 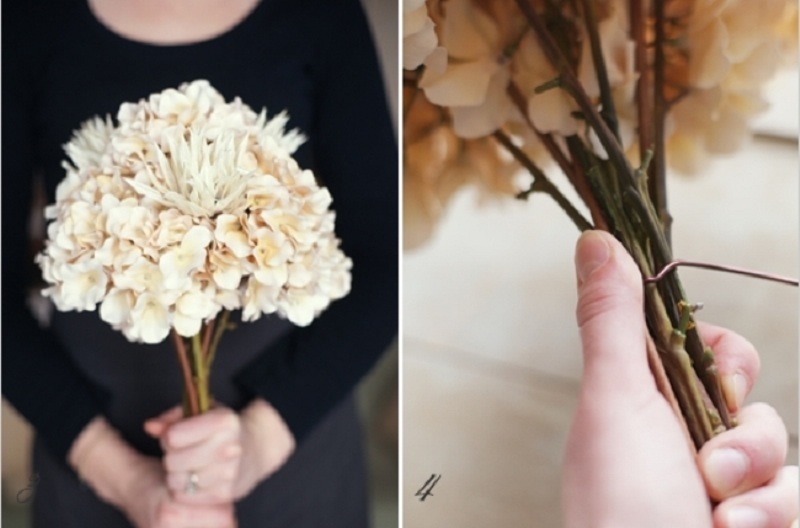 Cut the stems to the length at which it will be convenient for you to hold the bouquet. Trim them. 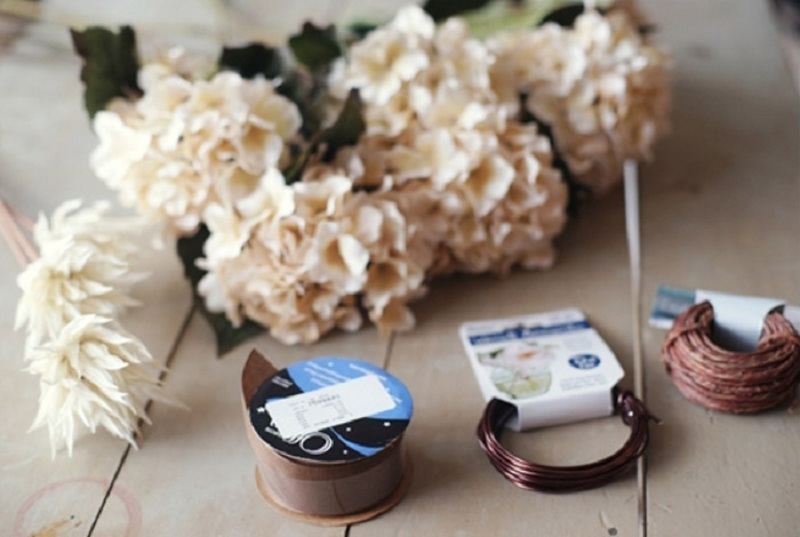 After that, you must tightly wrap the floral tape or organza trunks. Start winding on top, departing about 2 cm from the flowers, going down. 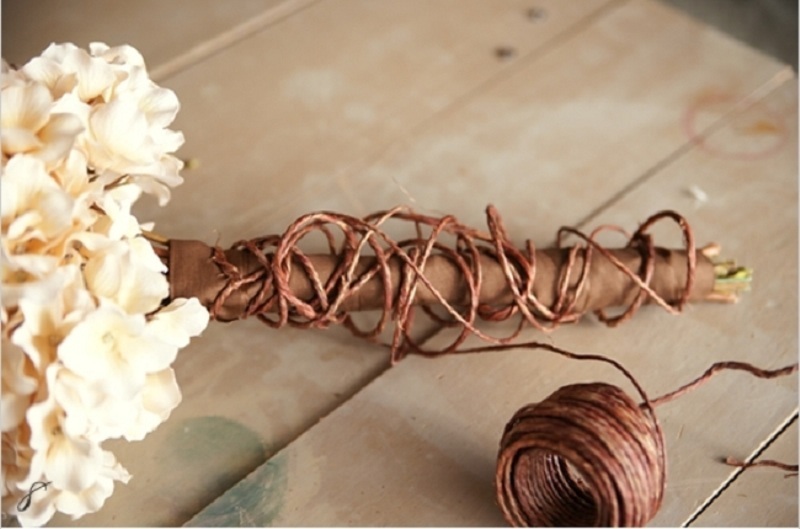 If you want the base of the bouquet to be thicker, then you should wrap the tape in two or three layers. It is important to carefully secure the tape with the button at the top and bottom. In the final version of the buttons will not be visible, since they will hide the splits. You should have a tight handle. 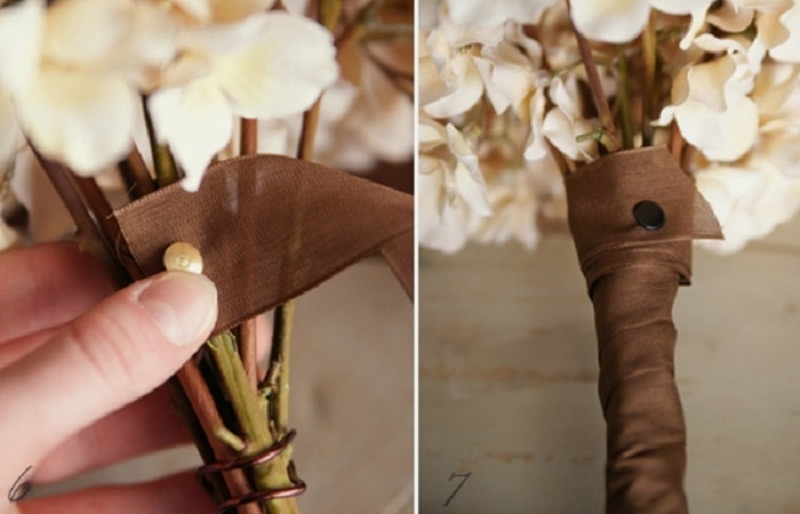 To decorate the handle, you can attach a bow to it or wrap it with lace. It will look elegant if you wrap the handle with a string. The wrap should be free and with imagination – there should be a lot of twines. 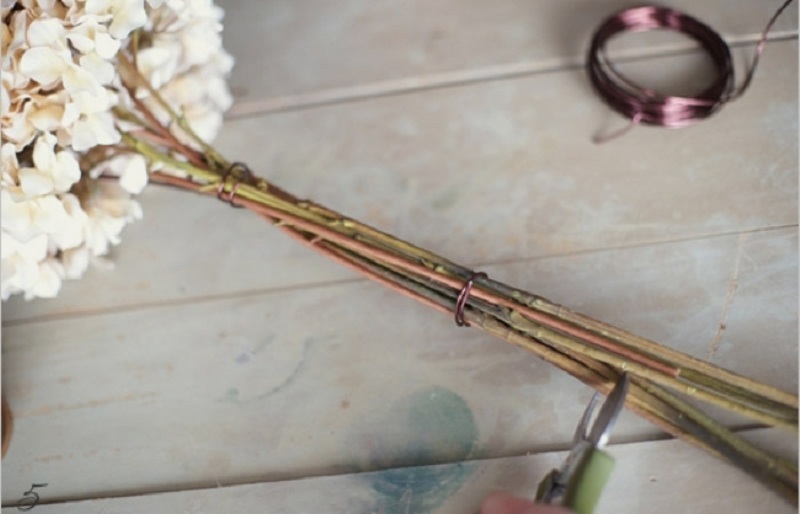 In order to secure the twine in order to avoid its unwinding in the process of celebration, pass the rest of the floral wire through the interlacing of the string thread, securing its rings with each other and with the stems.